I’ve been searching for inspiration for Christmas recipes – my plans are to make a series of recipes like last year’s – and a good place to start is Martha’s website; there are so many wonderful ideas there, everything’s so beautiful that the difficult part of it is choosing what to bake. Going through some of her cookie recipes for the holidays I remembered that I hadn’t posted these chocolate chip pecan cookies yet – suggested by my friend Ana Elisa I baked them back in July (if I’m not mistaken) and they were fantastic: delicious, easy to make (no special equipment necessary) and you won’t have to remember to take the butter out of the fridge in advance. Place the butter in a large heavy saucepan. Cook it over low heat, stirring, until completely melted. Remove from the heat and add both sugars, stirring to combine. Add the salt, vanilla and eggs. Stir until just smooth. Stir in the flour, baking soda and baking powder just until incorporated and a soft dough forms. Carefully fold in the chocolate chips and the pecans. Use an ice-cream scoop or a ¼ cup (60ml) measuring cup to measure out the cookie dough. Place the cookie dough balls on a baking sheet and refrigerate until firm, 45-60 minutes. Place the chilled dough balls onto prepared sheets, 5cm (2in) apart. Bake until the cookies are crisp and golden around the edges but still a little soft in the centers without being gooey, 15-18 minutes. Let cookies cool slightly on the sheets over a wire rack, then carefully transfer the cookies to the rack and cool completely. Cookies can be kept for up to 2 days in an airtight container, at room temperature. YUM, these look amazing! Great cookies...love that they're easy and delish! I know that butter and margarine aren't exactly one in the same, but do you think that the cookies would still turn out okay if I used margarine for this recipe? 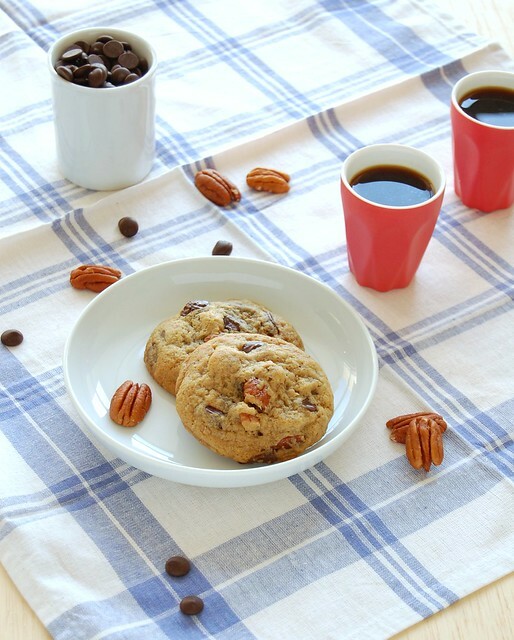 I love pecan nuts, I love cookies ... a great combo, for sure ! I'm addict to cookies, having one with chocolate and pecans is wonderful. Pris, I never use margarine. I just hate the stuff.